Web2.0 Might Just Have Gained It’s Greatest Ally Yet. Web2.0 might just have gained it’s greatest ally yet. Somewhere over the last week (to the best of my knowledge) Amazon.com has added several new features of social networking. That would make them, I think, the first online retailer to make use of this aspect of trendy Web2.0. I’d say, given how influential Amazon’s customer ratings and reviews are, they’ve been making use of social-web all along. However, here they are actively trying to engage their customers and users into helping make them a strong consumer resource and, hopefully for them, a more dominant retailer. Amazon has been around for quite a while in terms of the internet, and they are often seen as anything but cutting edge. Google is the brain-trust of the internet these days. Yahoo! has once again become a darling, although probably because they bought everyone’s darling, Flickr. eBay buys Skype to facilitate better communications between buyers and sellers. So many other companies and sites are seen as doing all the bleeding edge work. However, Amazon consistently proves itself as one of the most amazing places on the internet. The sell pretty much everything on the planet that can be delivered on a truck or digitally. In the UK, they even have a Netflix-like DVD rental store. They could get into music and movie downloads with almost the touch of a button1. What’s more amazing, is the fact that they’ve done all this without really ever acquiring any other company. It’s been Amazon all the way. What’s more, they love their customers and they seem to enjoy what their customers do for them. They’ve maintained a database-like store that they allow other’s to access for their own uses. They have always welcomed customer reviews and comments, even when less-than-favorable. That has been one of the corner-stones of Amazon’s success, in my opinion. The widely held view that whatever you say on Amazon gets left there. So, what’s next for everybody’s best friend who just never seems to get invited to the cool parties anymore? 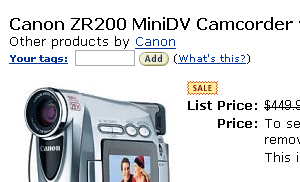 Add a tag word to describe the Canon ZR200 at Amazon.com. Many items now have this feature. First, they’ve added the ability for users to add "tags" to products. These tags can be public or private and could add more search able data to individual products. A person who read a nice review in Wired magazine could tag a product "wired" for anyone else who also wanted another way to find that product they remembered reading something about, but just couldn’t remember the manufacturer or model name. The possibilities spiral from there. Update 2005-12-06: I noticed today that tags were missing from various product pages on Amazon.com. I guess these are all very much in Beta at this point. Now Amazon’s users have a place to share the wealth of knowledge they’ve gained using products available there. 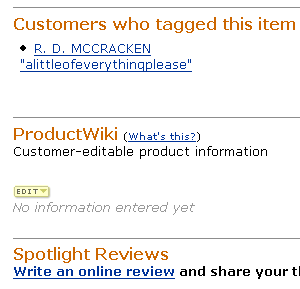 Much more quietly, they’re adding product Wiki’s written by users for any given product. Far too many product reviews have tips, hacks, and external data that really doesn’t fall under review information. The fact that third-party firmware makes my router more handy really isn’t a review of the router in-of-itself. However, that information is still very handy to know, plus where to get it and some brief instructions on installing it. Again, the only limits on functionality are by the users’ creativity. However, if you know that Amazon has loads of tips and tricks on the particular hardware you’re looking for, you’re liable to stick around the web site just that much longer and Amazon knows this. How well does this scale to other products? How far does your creativity lead you? I don’t mean to sound like some bad dot-com era commercial, but we just don’t know how useful this can be until customers get their hands on it. However, the Wiki has been very hard to find. I found it while browsing for a Canon camcorder a few days ago (when I grabbed this screenshot), but noticed it was nowhere to be found on the same page this evening. Other‘s have noticed this phenomenon as well; some saying that it depends on which computer you use. Of course, I’m on my same desktop and it has come and gone, so I’m not sure about that. No ones seems to have actually entered anything into one just as of yet2. I really want to get my hands on this thing and try it out. Lastly, as if my prayers were answered, Amazon has added a "Gift Lists" feature that allows users to keep track of the Wish Lists of friends and family (or whoever) as well as add "occasions" (i.e.  birthdays, anniversaries, valentine’s, etc.) and save gift ideas for that individual. Of course, the timing for the holidays is pretty obvious, and that is certainly where a feature such as this is most useful. However, how well this feature is implemented, I can’t say. I’ve only so-far been able to add several people to my Gift Organizer (that’s where you’ll look for this thing, by the way). I don’t know if you get some sort of nice e-mail reminder days before their birthday with the top several items on the list or any gift ideas you’ve added for them. That would be nice (and insanely easy for Amazon to implement, not to mention nearly cost-free for them). The only item on my wish list now, is that Jason J. and I had gotten on this project and beaten Amazon to it. Oh well. Maybe I’ll send them a Christmas card this year since they got me something. One last item in Beta at Amazon is Customer Discussions. I’ve not seen much at all of this myself, but I think it’s also pretty self-explanatory (you can see some more here). Here, you could ask the net about all sorts of product that might not otherwise have forums. Sure, people discuss iPods and Linksys routers all over the net, but what if you want to know more specifics about a book or movie? If you’re thinking about looking of a place to discuss those by searching at Google, then you obviously can understand how Amazon can capitalize on yet even more traffic here. Want to know if the latest Harry Potter book is too scary for your eight-year-old? Ask other Amazon users right on the product’s page, or perhaps someone’s already done the asking. The Native American tribes of the Hualapai Nation are building a giant horshoe-shaped glass walkway on part of the reservation in order to attract tourism. What makes this even more amazing is the fact that this part of their land is 4,000 feet above the base of the Grand Canyon. The bridge is a structural engineering marvel you’re shure to see some Discovery Channel specials about in the future. I can’t wait to walk across this when completed early next year (2006). This structure is so incredible as to have an entire article devoted to it at Snopes.com, the internet myth clearing house.